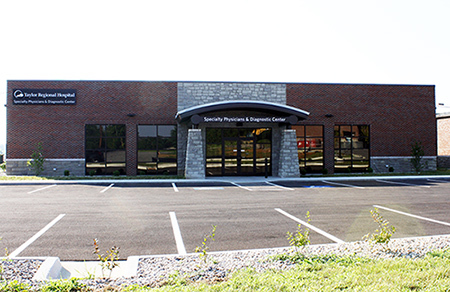 Located in Columbia, Kentucky, the Taylor Regional Hospital Specialty Physicians and Diagnostic Imaging Center opened in July of 2018. The Center provides on-site Laboratory, CT, and Diagnostic Radiology services and is also home to TRH specialty providers in the fields of orthopedics, podiatry, pediatrics and neurology. Pre-Admission Testing (PAT) is also available to our patients in Adair and surrounding counties beginning October 16, 2018. Each Tuesday, a Registered Nurse will be on-site to provide complete pre-admission testing appointments to patients including: EKG's, bloodwork (including blood bank) and x-rays. PAT appointments are available from 12:00 p.m. to 4:00 p.m. CST (1:00 p.m. to 5:00 p.m. EST) on Tuesdays and may be made through TRH Centralized Scheduling by calling (270) 789-6105. The Taylor Regional Hospital Specialty Physicians and Diagnostic Center is located at 187 Will Walker Road in Columbia (across from Wal-Mart) and is open 7 days a week from 9:00 a.m. to 5:30 p.m. Central Standard Time. Walk-ins are welcome for radiology and laboratory services; however appointments are required for specialty providers and CT scans.